Al-Jebel Al-Akhdar – Oh Man, Oman, Man! I had quite a long weekend, so I’m still a day behind. Hopefully by tonight I’ll be caught up. While the weather in Oman is very hot, it’s actually very cold inside. Every room has its own air conditioning unit here, so having a jacket inside is almost a necessity. I never thought I would have a problem being too cold in the Middle East. Yesterday we went up to explore al-Jebel al-Akhdar, one of the most spectacular regions in Oman. There were tall mountains and huge canyons, and the weather up in the mountains was actually very pleasant. 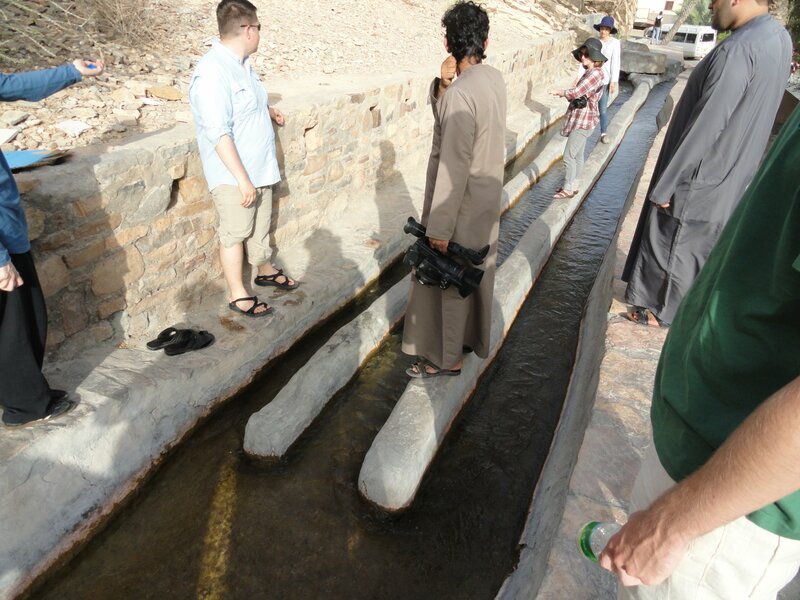 We began with visiting a wadi, which is a riverbed through which water flows only in times of heavy rainfall or flooding. Around the wadi was an ancient village. We were able to walk up the stairs and explore inside the buildings of the village. I climbed almost to the top of the mountain, which wound up being pretty hard since there wasn’t really a path. The ancient village of Jebel Akhdar. Another shot of the ancient village. On top of one of the buildings in the village. Near the top of one of the mountains. The caravan of government-plated cars that were used on this outing. After that we went to visit a rosewater factory. That was interesting because I learned that there are several types of rosewater; my favorite was one that had a much smokier scent. We then went to see a spring as well as some of the terraced farms for which the region is famous. The spring is called an ‘ayn (عين) in Arabic, which has a sound that doesn’t exist in English, and the farms are called mudarraj (مدرج). Another view of the mountains. The spring. There were a few people swimming in it later (not tourists). A view of the mountains and valley. Me with Khalil, the a Media Administrator at the college. Huge cactus at the rosewater factory. After this, went to the Sahab Hotel, a resort on the top of one of the mountains there, for lunch. We had a most excellent buffet. There was also a swimming pool that some of us used, but I didn’t bring my bathing suit and was also far too tired. After lunch, I was about ready to just go to sleep. The buildings and greenery around the hotel. The famous “hummus glue” method. I’m probably going to gain weight here… The sweet on the right was a kind of rosewater flavored pudding. After lunch, we made a few more stops at various places around the mountains. Pictures really don’t do the views justice. The famous terraced farms I mentioned earlier. To end the day, we saw one more falaj, the Khutmain Falaj, which is famous because it splits into three parts of equal volume. It is a UNESCO world heritage site. The Khutmain Falaj and its three channels.